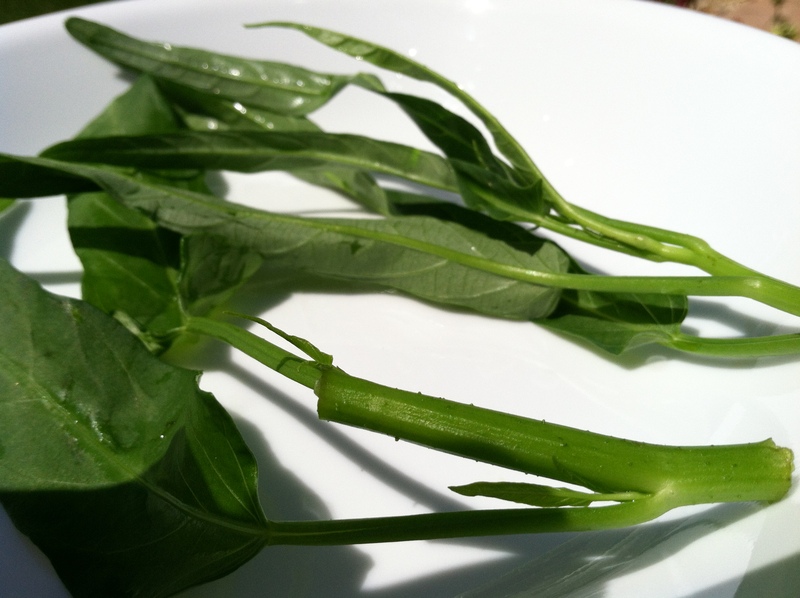 History: The origins of this plant is unknown, but it In English, the more commonly used name is water spinach. That’s because it is semiaquatic and grows under tropical conditions; it can be found in ponds or even in moist soil. The scientific name is Ipomoea aquatica. It’s popularity in Southeast Asian dishes is best explained by its easy of growth in waterways over there. More commonly known names are: water spinach, river spinach, or even water morning glory (the flower resembles that of the plant, but do not eat the flower). The Cantonese like to call it ong choy, 蕹菜; whereas the Mandarin like to call it kōngxīncài 空心菜. You can find ong choy at your an asian market. It’s much more preferable to buy from farmer’s market though because they’re fresher and better quality. It’s tough to pick because ong choy is usually sold in bunches. I have yet to find a vendor or market where you can choose stem by stem. Notice that the two pieces of kongxincai above have already been prepared for cooking. I mention this because the typical length of the entire water spinach is actually 7-10 feet; in markets though they range from 1-2 feet. Texture: Notice in the image above that there are minuscule bumps. Once cooked, these bumps do not come into play meaning your tongue will not be able to pick up the bumps in the stalk. Kōngxīncài in Mandarin means empty heart and surely enough, the stalk is hollow. The veins within the leaves are not too thick so when pan fried your tongue will not be able to probe for its existence. 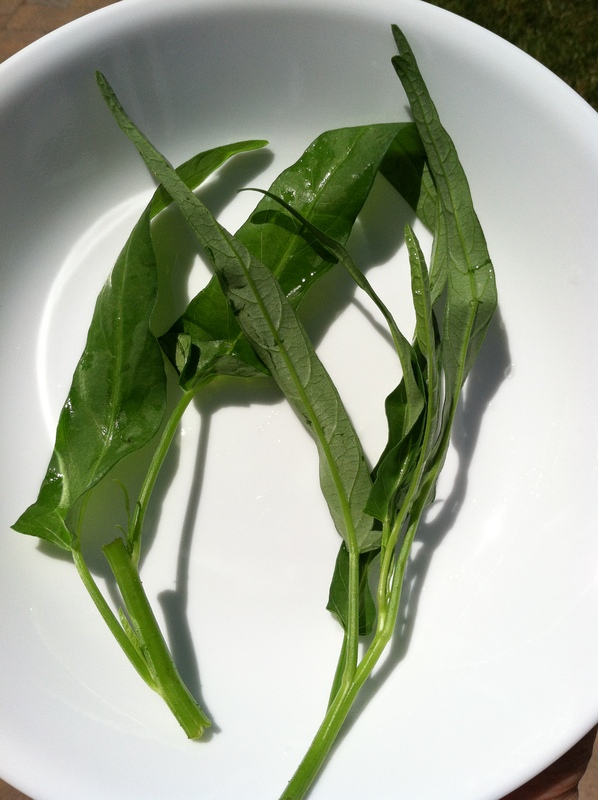 What makes ong choy so special is the perfect balance between the stem and leaves. Once cooked, we’re talking about 50/50 in your mouth. The leaves are a soft texture that soak up the sauce you have stir fried it in. The stems have sauce on it, but do not soak any up. The crunchiness that the stalk provides, is a derivative of it’s “empty heart” (kongxin). Together, the stems and leaves create a brilliant complement in the mouth. 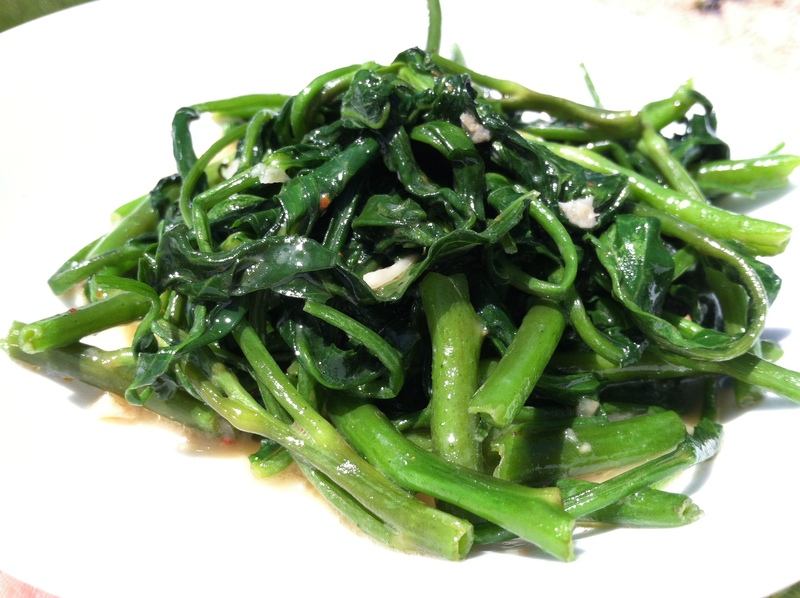 Taste: Unlike the gai choy, there is no hints of mustard in the ong choy, nor is there any bitterness as there was in the red dandelions. I believe that its sole purpose is to exemplify the superiority of the way the stem and leaves complement each other. Have you eaten ong choy before and what is your favorite way to cook it? Do share your favorite recipe in the comments below! Ah, we call it kangkung or ong choy as you do. One of my very favourite veggies especially when cooked with belacan (fermented shrimp paste) and sambal. That’s the best. Good in fried rice too! I’ve never heard of kangkung. What language is that in? Belacan is Filipino correct? I’ve tried it with shrimp paste but not sambal. Thanks for the recs dear!